I am so excited to introduce you to a new pattern: the Mapleshade tee! 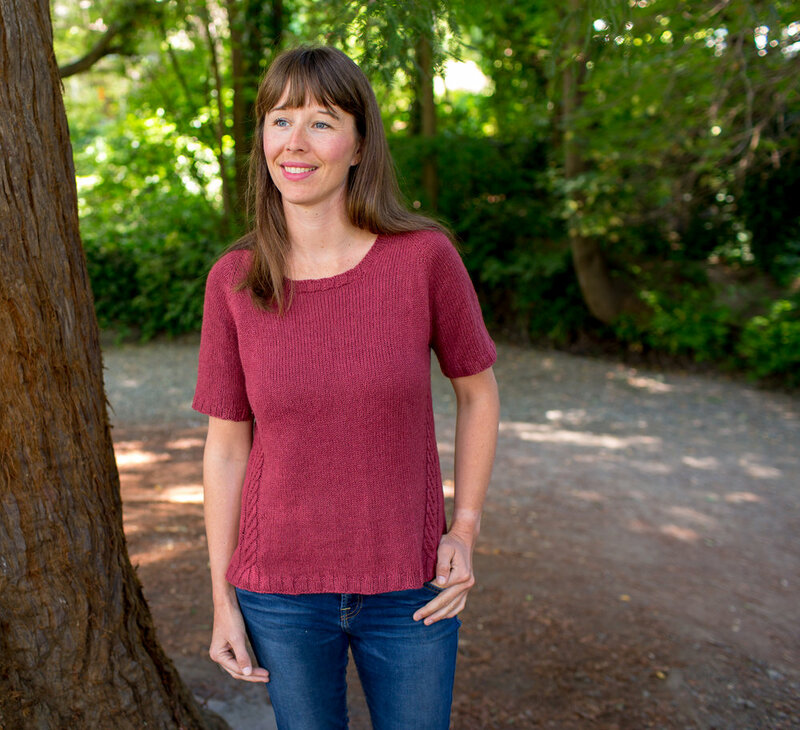 This breezy, linen-blend tee is great for both knitting and wearing in the summer, and is a speedy, straightforward knit with just enough detail to keep things interesting. I'm a year-round cabled sweater knitter, and was, as many of you saw on instagram, knitting an Aran-weight wool sweater while on holiday on a beach a few weeks ago, but I get it: sometimes you want to knit the thing you can wear right now, not the thing you can knit now and wear in a few months when it cools off. Something with short sleeves or no sleeves, with enough cotton or linen not to feel utterly bananas in the summertime, something unfussy to work on but with enough going on to keep you engaged in your knitting. Enter Mapleshade: an easy-to-wear tee with a gentle A-line shape and a graceful drape, with lines of delicate cables that shift subtly forwards down the body for an ultra-flattering look. Seamless, top-down construction makes for a quick, straightforward knit, while thoughtful details in the yoke shaping anchor the sweater on your shoulders for a perfect fit. 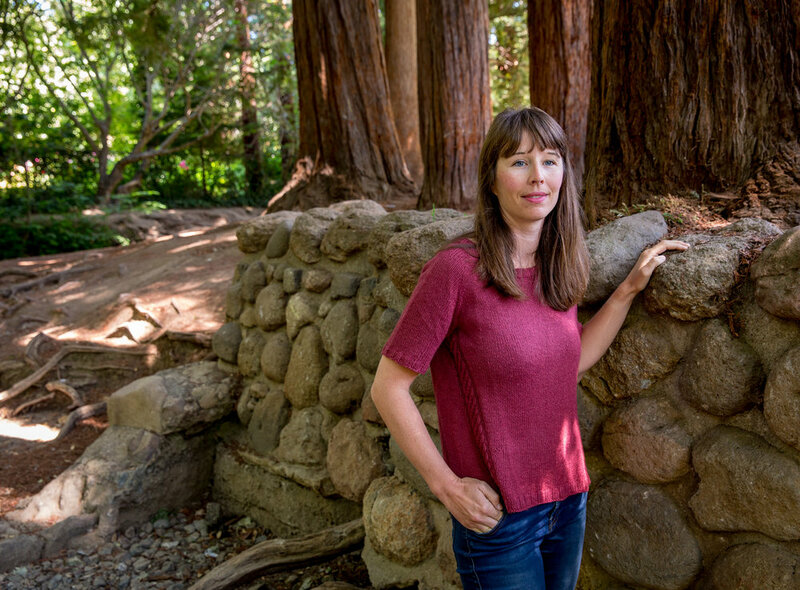 Knit one up in a yarn with a hefty dose of linen or cotton and you've got yourself an elegant, super wearable wardrobe staple for spring, summer, and early fall. I designed Mapleshade in The Fibre Company's Luma, a blend of linen, wool, silk, and cotton. I'll be the first to admit I've been a bit hesitant about plant fibers, because they have a quite different feel in your hands, and produce a very different fabric than 100% wool or blends of wool and other protein (animal) fibers—and can be a little unforgiving of irregularities in your knitting. Luma is a great toe-dip into the plant-fiber space: there's enough wool content that it feels "normal" (to my hands, at least), and to give the fabric the resilience and bounce you want in a garment, but the hefty dose of silk, cotton, and linen give it lightness, drape, and a summer-appropriate vibe. When I brought this sample with me when I went to the Squam Art Workshops in New Hampshire a few weeks ago, it didn't yet have a name. It was too cold to wear it for the first few days, but as the weekend drew closer, the afternoons warmed up and it got its first "real" outings as we sat on the dock, knitting in the sunshine. It came back home and got tidied back up for our photoshoot (your sweater shaver is your best friend, folks), and it doesn't smell quite as much like pine needles anymore, but it is imbued with the memories of the easy days of early summer, and the amazing friends and colleagues with whom I shared that week. And so, it got its name: named for our cabin and that dock and all the memories that went along with it. It never fails to make me smile. Wherever your version goes with you this summer, I hope it brings a bit of it back, and brings you that same joy. Added bonus? Mapleshade is 20% off for its first week (until June 28, 2018) in my Ravelry store, with no code needed -- just add the pattern to your cart and checkout before midnight PST on the 28th to receive the discount. Happy knitting!